Who would knew that one day Chinese New Year would be an event looked forward to by watch collectors and connoisseurs world wide, myself included? This day of celebration not only includes the important dinner with family, but also a wide variety of new watches dedicated to the zodiac sign of the year ahead. 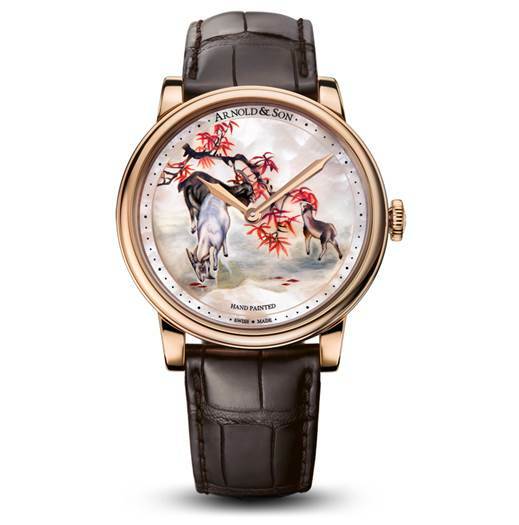 And not just any watch, but miniature master pieces like the Arnold & Son HM Goat. A delicate portrait, painted on mother of pearl, of a family of goats eating leaves. It is the subtle honesty of this seemingly casual composition that gives this painting such an impact. You can stare at it and get completely lost in the tranquility of the scene, actually forgetting that the Arnold & Son HM Goat is, of course, a fully functional timekeeper. Actually that can even qualify as an understatement since housed in the 18-carat rose gold case, is beating caliber A&S1001. This manual wind manufacture caliber has an old school look and finish, with its blued screws and hand chamfered bridges, but is in fact a modern motor with a double barrel, providing 90 hours of power reserve. 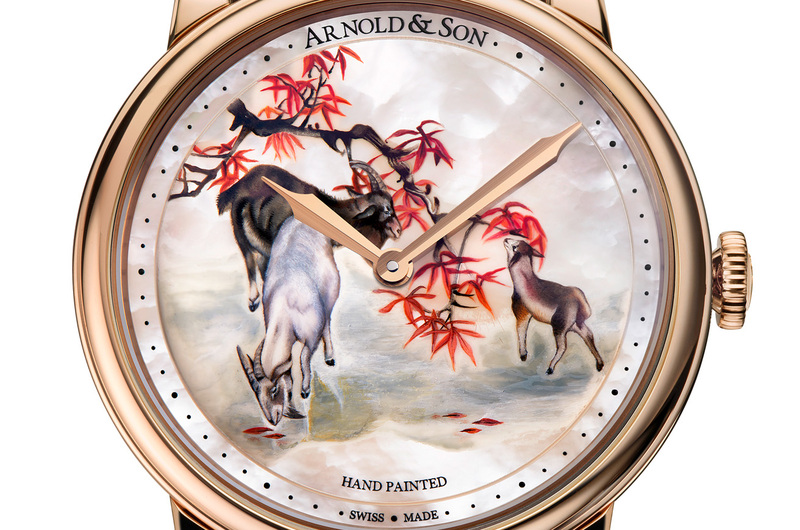 It seems that Arnold & Son has created an almost perfect tribute to the year of the goat. Almost, because personally I could have done without the the words “hand painted” on the dial, which seems to state the obvious, and if not than only adds to the understatement of this beautiful piece. Additionally Arnold & Son has limit this edition to only 8 watches, which will without a doubt disappoint many, while providing pure joy for those who have been able to secure one, confirming that for them it will indeed be a year full of promise and prosperity.